Outrageous Acts of Science is back. Recently, the Science Channel announced season six of the series will debut next week. Season six of Outrageous Acts of Science debuts on October 26th at 9 p.m. ET/PT. Science Channel’s OUTRAGEOUS ACTS OF SCIENCE, featuring out-of-this-world viral videos and a team of experts revealing the science behind the stunts, returns for a new season Wednesday, Oct. 26 at 9PM. The all-new episodes show mind-blowing displays of science in action while counting down the week’s Top 20 videos. The real-life scientists who uncover the principles behind the backyard experiments this season include astrophysicist Hakeem Oluseyi, physicist Debbie Berebichez, robotics engineer Eric Gradman, molecular biologist Adam Ruben, materials chemist Sujata Kundu, nuclear chemist Alistair Linsell, biologist Carin Bondar, mathematician Matt Parker and engineer Mike North, among others. “Each episode features popular videos that showcase human ingenuity and occasionally flat out insanity as our team breaks down the science behind each experiment to take everything you thought you knew about science and turn it inside out,” said Wyatt Channell, executive producer of OUTRAGEOUS ACTS OF SCIENCE. In the premiere episode, “Power Hungry”, the featured clips include a whip cracking amateur looking to beat a word record, an explosive keg that becomes a beer fountain and ice swords that splice gourds. 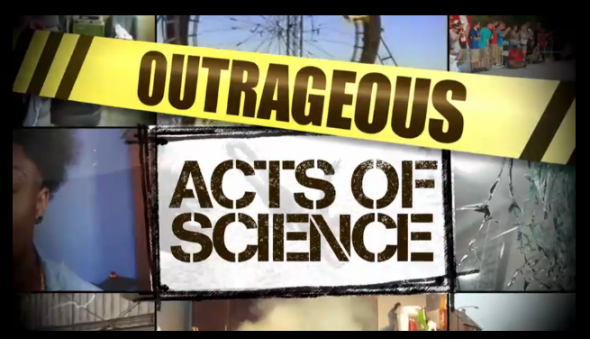 OUTRAGEOUS ACTS OF SCIENCE is produced for Science Channel by October Films. For October Films, the executive producers are Denman Rooke and Gareth Cornick. For Science Channel Wyatt Channell is executive producer. What do you think? Have you seen Outrageous Acts of Science? Will you watch the new season? More about: Outrageous Acts of Science, Outrageous Acts of Science: canceled or renewed?, Science Channel TV shows: canceled or renewed? Can’t wait for the new episodes to air. I hope I am still being featured on Nov 9th with my handcrafted boomerangs. Loved having the Discovery channel here at my home to film some of my boomerang flights and really looking forward to watching.